The many benefits of applying Lovitt's Deep Bond (Deep Penetrating Sealer) are permanent. Lovitt's Deep Bond is not a surface sealer. Lovitt's Deep Bond effectively starts working as a sealer about 2 to 3 mm below the surface of concrete. However, Deep Bond is much more than just a sealer. Lovitt's Deep Bond contains a proprietary catalyst which causes a chain reaction to start upon application. Allows Deep Bond to penetrate below the surface of the concrete or alkali bearing substrate where it "pursues moisture" down through the substrate. Upon contact with substances already contained in concrete and calcium hydroxides (in that moisture), it reacts instantly to form a silica gel membrane on the (moist) surfaces of all voids and particulates (sand, aggregate, and portland cement) immediately sealing the substrate. Over a short period of time this silica gel membrane hydrates into a solid, yet breathing, glass impregnated mass which provides a permanent seal and moisture barrier that resists aeration and deterioration. This action also increases surface hardness/dusting resistance, compressive, and flexural strength of the concrete receiving application. 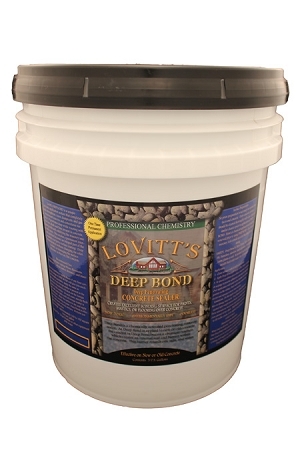 Lovitt's Deep Bond is a revolutionary concrete protector and waterproofer. Deep Bond penetrates the concrete upon application and pursue the natural moisture, lime, and alkali contained within concrete to deep penetrate and chemically convert to an aero-silica gel inside the concrete. This gel fills the micro pores and slowly hydrates to a glass like substance that lines the voids. This action seals the internal voids from penetration from water, acids, and oils while allowing the concrete to breathe naturally. This reaction also hardens the surface and virtually eliminates dusting of the concrete and premature wear to the surface.